SafePcAv is a fresh rogue antispyware program from WiniGuard family of rogues as GuardWWW, MyPcSecure, PcSecureNet, PcsSecure, APcSafe, ProtectSoldier, etc. 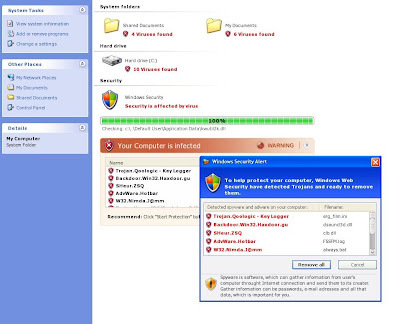 SafePcAv installed from fake malware online scanner through the use of trojans. Like other rogues, SafePcAv imitates a system scan and reports false infections as method to trick user into purchasing a full version of the program. If your computer is infected with the rogue, then follow the SafePcAv removal instructions.